In my “43 goals for year 43” I promised myself I’d fly a kite this year. I bought one, ostensibly for the munchkin, almost two years ago; Joy and I were enjoying a lovely couple-alone weekend in Bodega Bay, freed by our dear friend Wendy’s taking our daughter into her home for a couple of days, and of course we mostly talked about Munchkin and bought her a couple of presents. She was really too young for a kite, but I picked out one I thought she’d like–a ladybug–and explained to her what it was. We brought it to the beach on one glorious day several weeks ago, but it was so glorious that there wasn’t enough wind to raise a kite. 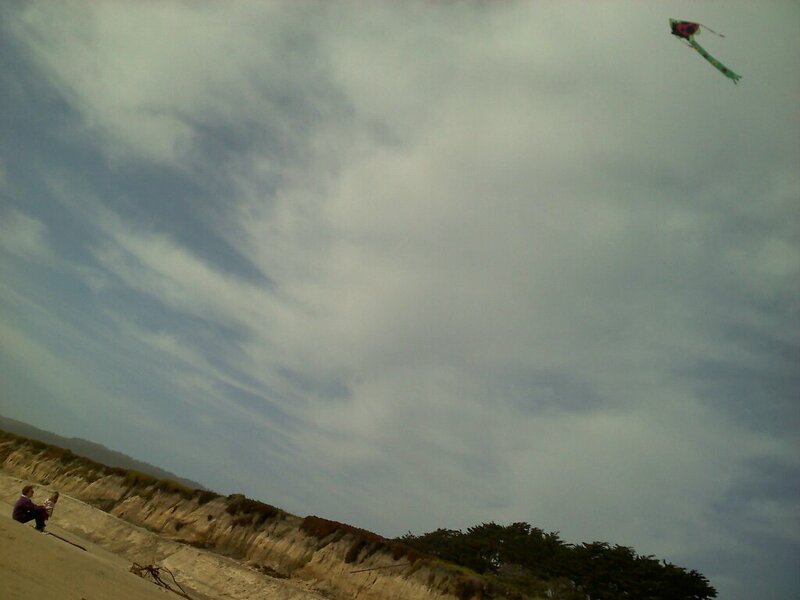 Yesterday we took a trip to Venice Beach, in Half Moon Bay, and this time the kite flew. It was so simple, so unthrilling, really. The munchkin gave it a single smile and then went on with the more exciting business of writing in the sand. Joy said, “Yep, it’s a kite.” I’d deliberately bought a very simple kite, fearing that a two-string trick jobbie would be beyond us. Once it was flying and I’d admired it for a moment, there was nothing to do but tie up the string and read my book or look at the ocean (which meant turning my back on the kite, since of course the wind was coming from the water). But I kept looking up at it, feeling very moved, and it wasn’t until then that I realized why I had even cared about flying a kite, and why I’d thought of it as a difficult thing to accomplish. It has to do with the kite that hung in the back of my closet through all of my growing up. I have no recollection of ever flying that or any kite in my life. Maybe I did at some point and have forgotten, but what I chiefly remember about kites is frustration. We bought it and tried it at a local park; it didn’t fly; it came back home and sat in the closet for the next umpteen years, a silent reminder of a bit of fun that, literally, didn’t get off the ground. At some point a friend and I made another one of paper and string, but of course that had even less of a chance of working. We probably only had bad luck at that day at the park, but kite-flying stuck in my mind as something tricky and elusive. It wasn’t a big deal; I haven’t borne a kite-shaped scar on my soul for 35 years; but clearly it was a little piece of unfinished business. Yesterday it was finished, and a small sorrow was replaced with a small, sweet blessing. A lot of my life with my wife and daughter is like that. Oh I think it was a big deal! Thanks for sharing. What a lovely story! May you and your wife and daughter enjoy many more days at the beach flying kites together. The bus that stops on our corner runs all the way to the beach. I feel like we ought to be hopping on it every Saturday morning . . . I have this image of the munchkin’s great-grandparents taking the streetcar to Coney Island and coming back with sandy feet and sunburned faces. Probably that is as mythical as the idea that we’d go weekly (they probably stayed indoors working during most lovely summer days), but we could manage monthly. Thanks, Amy, for your comment on my blog, TheNakedTheologian.com, and for adding me to your UU religion blog list. I quite agree with your comment on my post; there’s something I can’t quite grasp about Danes who don’t believe in God but call themselves Christian. What then does being Christian mean to them? My French relatives never set foot in Church except for baptisms, weddings, and funerals, but they would be surprised if I asked them whether they believed in God. They would say–of course–who doesn’t? In any case, I’m subscribed to your blog and look forward to reading your future posts. I should clarify: I don’t find it surprising, especially in a country where almost everyone shares a religion and the same ethnic background. Maybe being Christian there is like a culture or an ethnicity, the way many American Jews perceive being Jewish. But that’s speculation. We’d have to ask them to know. Kites are great. The simple things are a great break from the normal day to day. A chance to relax and ignore the standard hectic-ness that life has become. A hope behind my “43 things” is that I’ll do more of that. Worry less, do more soul-nourishing things.